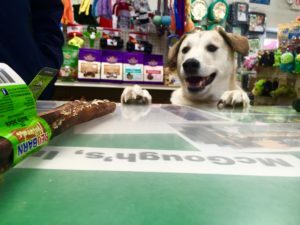 Pet Food & Supplies at McGough's Inc. Pet Food & Supplies – McGough's Inc.
We understand that pets are part of the family and they deserve the very best. 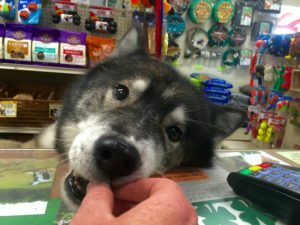 At McGough’s, you will find the daily essentials for your pet: premium, made-in-America foods from a variety of trusted companies; toys, natural and grain-free treats, dental chews and rawhides; flea and tick prevention; health supplements and grooming supplies, and more. 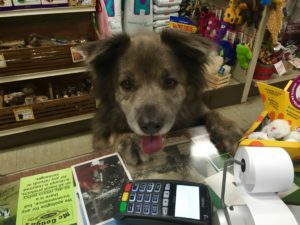 At McGough’s, we take pet nutrition seriously. We offer a wide range of foods for our canine and feline companions. Our goal is not only to provide the most nourishing options for your pets, but to ensure we answer all your questions, and to make feeding a premium diet affordable with competitive pricing. Our staff is knowledgeable in pet health and is able to help you determine the best food to improve your pet’s digestion, have a shiny coat, maintain healthy joints, reduce allergies, and increase overall well-being. We are committed to offering high-quality, consistent products that also are mindful of family budgets. Several of our top-rated foods have frequent buyer programs, and we carry the largest bags available in many formulas in order to allow you to take advantage of the best pricing possible. We love pet visitors! Whether you’re accompanied by a dog, cat, baby goat, bunny, parrot or a pot-bellied pig – we love to give attention (and treats!) to the animal members of your family.